'Unassailable culinary credentials.' The Times'A really great kitchen companion, full of easy-to-follow tasty dishes based on good-quality ingredients.' 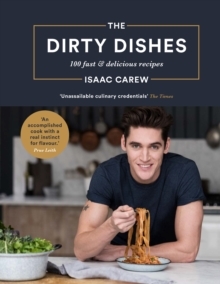 Gizzi ErskineClassically trained chef and model Isaac Carew takes it back to the kitchen with his debut cookbook The Dirty Dishes, featuring the fun, delicious and tasty food that's inspired his life-long love of cooking. The Dirty Dishes is a fresh and modern collection of one hundred recipes: from lazy brunches to easy weekday suppers, and from vegan delights to late-night bites. He shares new takes on classics including Poached Salmon Nicoise, celebrates his love of pasta with Lasagne, Crab Linguine and Butternut Squash Cannelloni, and introduces more adventurous yet surprisingly easy recipes like Tamarind Treacle Tart. Modern and bursting with flavour, the book reveals the secrets of Isaac's culinary training and gives you everything you need to get a bit messy and have fun in the kitchen. Isaac's dad and godfather both worked in kitchens, so Isaac grew up washing mussels and leafy greens. He qualified as a chef in his teens and went on to work in some of the best restaurants in the world. Since then, via a high-profile modelling career, Isaac has nurtured his passion for great cooking and diverse food with the fashion capitals as his inspiration.